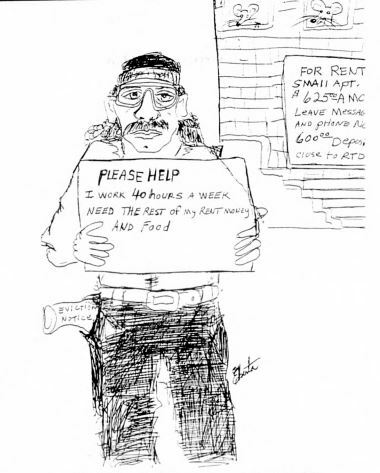 Denver's newspaper for and by those experiencing homelessness joins our online catalog! This month, the Colorado Historic Newspapers Collection welcomed the Denver Voice to its online catalog and we could not be more excited! Our users will now have access to nearly 100 issues of the Denver Voice, spanning from its first issue in 1996 right up to its brief hiatus in the spring of 2006 before it became a professional publication the following year. This unique newspaper doesn’t just tell the story of Denver in a time of tremendous change, it tells that story from the perspective of some of its most underrepresented and often unheard citizens: those experiencing homelessness. While the Voice now reaches a broad and diverse audience, it began as a grassroots newspaper written by homeless people for homeless people. Its early issues include everything from news articles about encounters with local business owners and police to poetry and cartoons inspired by the hardships and joys of its unique community. Each issue also includes a list of places where its readers could find necessary resources like a meal, a bed, or bathroom and shower facilities. Most importantly though, the Voice offered (and still offers) an outlet for expression and a connection to a community for many people who were often marginalized and overlooked in their own city. We at the CHNC are honored to welcome the first 10 years of the Denver Voice to our collection and look forward to adding more years in the months to come! So come check out this truly amazing newspaper at ColoradoHistoricNewspapers.org and see how easy it is to broaden your perspective and change the way you see our uniquely Colorado history! Previous Should Wolves be Reintroduced in Colorado?